Ernie Delco is one of the highest-ranking officials of the company that provides you, me and 700,000 Cebuanos with a resource that, without which, we will die in a few days’ time: Water. Metropolitan Cebu Water District, or the MCWD, as we all know it, is the water utility firm and Mr. Delco is the Assistant General Manager for Operations. Last week, an amazing experience Ernie went through…. It started middle of last year when the City West Water utility company—the counterpart of MCWD in Melbourne, Australia, with the assistance of the Asian Development Bank (ADB)—invited officials from Cebu for a weeklong visit. Fast forward to early this month and the MCWD officials were given a tentative departure date for Melbourne of January 18. The problem was, plenty of documentation was yet to be processed and, when Jan. 17—the day before departure—arrived, they had yet to be issued Australian Visas. Well, as God willed it, at 5 p.m. on Jan. 17, the visas arrived and, true to schedule, on Jan. 18—Sinulog day—five MCWD top honchos left Cebu for Melbourne. Why all this water talk on the sports pages? 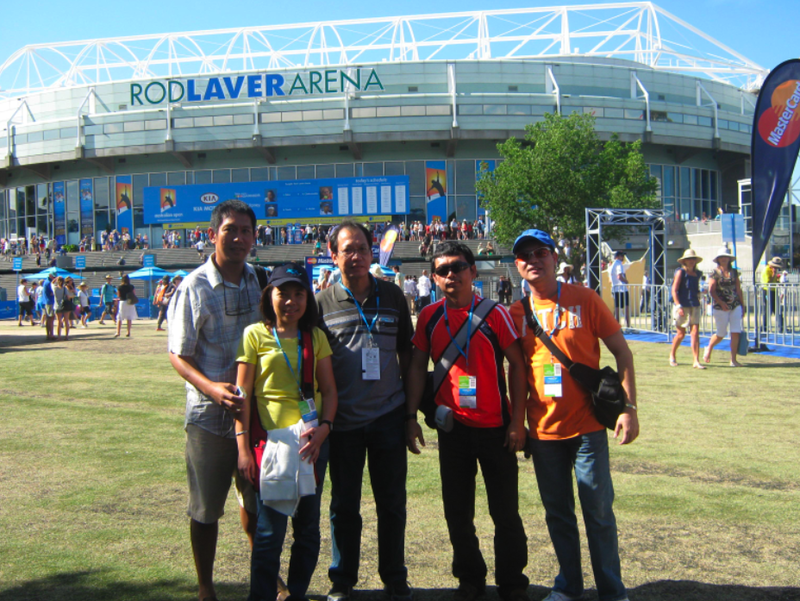 Because Wednesday of last week, our fellow Cebuanos were treated to an unforgettable occurrence: They were given free tickets, complete with dinner at the chic Grand Slam Room, to watch the event that we all view on TV: the 2009 Australian Open. “It’s a dream come true,” said Ernie, when we spoke over the phone yesterday morning. Ernie, 42, started playing tennis during college over two decades ago and, while he no longer plays everyday like he did before, he still swings backhands and smothers those first serves once a week at the MCWD courts (at D’ Family Park) in Talamban. After having a first-hand look at the “Oz Open,” I asked Ernie who he believes will win this Sunday. His reply was the smartest I’ve heard or read: “I give all four of them a 25 percent chance each,” he said, referring to Nadal, Federer, the defending champion Novak Djokovic and the odds-makers’ favorite, Andy Murray. Wise call, Ern. Now on his 20th year with MCWD, he’s a tennis expert because he’s followed the sport even longer. “Grabe ko ka addict sa tennis,” Ernie confessed during our 10-minute conversation. Same with MCWD executive Mike Balazo, who plays at the La Paloma and Baseline Tennis Clubs—he’s another hard-core tennis fan. And while not regular players, Ernie said that General Manager Mandy Paredes, Noel Dalena and Wawa Teñedo all immensely enjoyed the experience. Now back in Cebu (last Saturday) after six days in Melbourne, our five MCWD honchos, when they watch TV and click on Star Sports, can all smile, reminisce and proclaim: I was there!